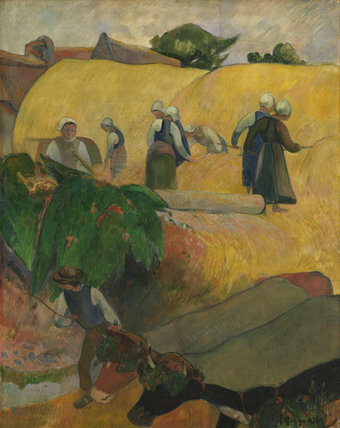 Description: Gauguin painted this haymaking scene during his third extended stay in Brittany. He was attracted to the region’s traditional customs and costumes as an escape from Paris, finding “a certain wildness and primitiveness here.” Spatial recession and perspective are deliberately ignored. The haystacks and the bush to the left are simplified and rendered only as bright patches of flat colour. But the simple life Gauguin sought was already disappearing: he complained that his usual base of Pont-Aven was now spoilt by crowds.